KB5350G is an ideal product with a great deal for customers who looking for a bargain, a perfect choice for the store, home, travel and studio! It can accommodate up to 3 instruments on this rack, suitable for acoustic and electric guitars, basses, ukuleles and violins. Rubber neck rest holds instrument gently and securely. Each neck rest adjusts to fit instruments of varying body depths. Rails may be positioned wide or narrow to accommodate full-body guitars to ukuleles. Finish-safe cushions support instrument bodies. Upper rail adjustment from highest setting for guitars and basses to lower setting for ukuleles and violins. 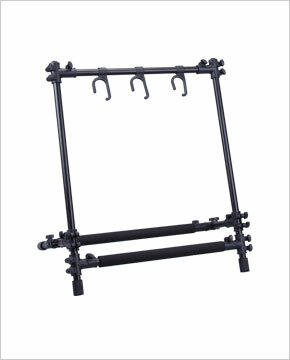 Rack folds quickly and easily for travel and storage.